In the 18th and 19th centuries, the plot of the family drama was heated by the passion and moral purity of its participants, attracted musicians, writers and artists, and inspired them to create a large number of works of art. Only paintings are known for more than thirty. The theme “Antiochus and Stratonica” became a favorite for Dutch, French and Italian artists. Antiochus, the son of the founder of the Seleucus dynasty, who ruled after the death of Alexander the Great, fell in love with his stepmother Stratonica. Considering that his passion is hopeless, he began to look for a way to commit suicide, introducing himself as a sick man – he starved himself. 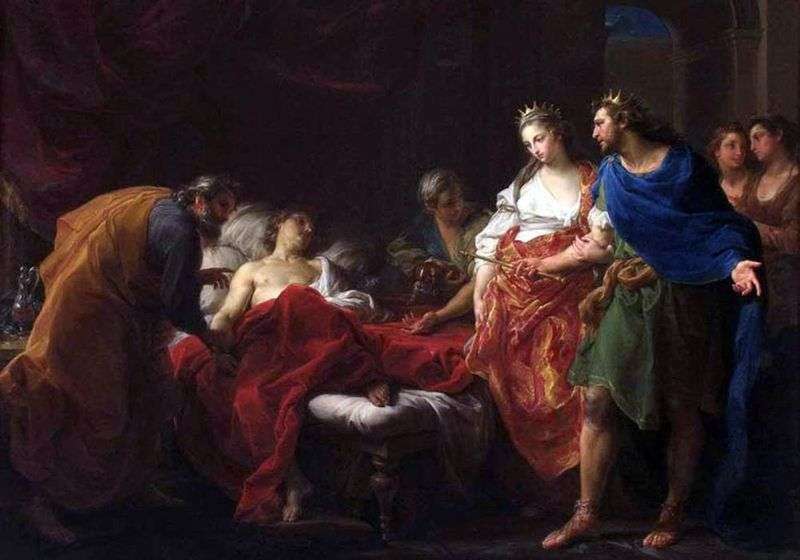 The court physician Erasistratus quickly guessed the nature of his illness: sitting in the bedroom of Antiochus and watching his reaction to the ladies who came to him, he soon realized which of them was the cause of the mental disorder of Antiochus. Erasistratus reported this to Seleucus, who in tears announced his abdication and the transfer of Antiochus not only his kingdom, which he would inherit in any case, but his wife. Sometimes in the corner, but not all artists, her husband Seleucus is depicted. The meaning of all paintings is that they depict the moment when the wise doctor realizes the true cause of his patient’s illness. Description and meaning of the painting Antiochus and Stratonica by Pompeo Batoni.